2 drawing on paper (1 sheet) : ink ; top image 4.75 x 6 in., bottom image 4.75 x 3 in., on sheet 9.5 x6 in. 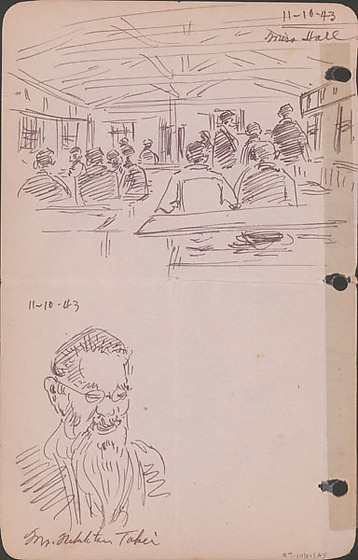 Ink sketches of people in mess hall and Mr. N. Takei on Novermber 10, 1943. Top sketch of mess hall interior with thirteen non-distinct figures seated at tables, most with back to viewer ; crossbeams visible above. Lower sketch of Mr. N. Takei, a bearded man wearing glasses visible from chest up, identified by an inscription. Drawing 97.106.1AW on recto of same sheet. Written in black ink on top image, top right corner: 11-10-43 / Mess Hall. Written in black ink above bottom image, top left: 11-10-43. Written in black ink below bottom image: Mr. N[unreadable] Takei.